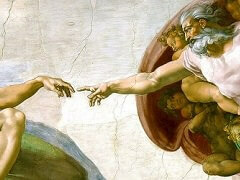 Michelangelo was without doubt one of the most inspirational and talented artists in modern history. During his life, the western world underwent what was perhaps the most remarkable period of change since the decline of the Roman Empire. The Renaissance saw changes in all aspects of life and culture, with dramatic reforms sweeping through the worlds of religion, politics, and scientific belief. Michelangelo was one of the most fervent advocates of this exciting new philosophy, working with a remarkable energy that was mirrored by contemporary society. One of the leading lights of the Italian Renaissance, his extraordinary talents emerged in early works such as the Pieta for the Vatican, and the statue of David commissioned for the city of Florence. His paintings and frescoes were largely taken from mythological and classical sources works. He manage to combine his high level of technical competence and his rich artistic imagination to produce the perfect High-Renaissance blend of aesthetic harmony and anatomical accuracy in his works. 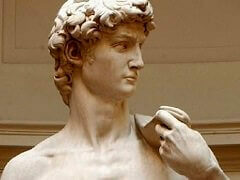 Michelangelo was born on March 6, 1475 in Caprese near Arezzo, Tuscany. He was the first artist who was recognized during his life time. He is also the first western artist whose biography was published when he is still alive. Two biographies for him was written, one was by Giorgio Vasari, who praised Michelangelo as the greatest artist since the beginning of renaissance. 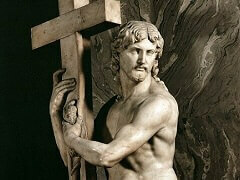 He is the best documented artist in 16th Century and has influenced so many areas of art developement in the West. Together with Leonardo Da Vinci, the two stood out as strong and mighty-personalities with two irreconcilably opposed attitudes to art , yet with a bond of deep understanding between them. At age of 6, Michelangelo was sent to a Florence grammar school but he showed no interest in schooling. He would rather watch the painters at nearby churches, and draw what he saw there. His father realized he had no interest in family's financial business and agreed to send him to the painter Ghirlandaio to be trained as an apprentice. He was 13 years old at time. In this fashionable Florentine painter's workshop, Michelangelo learned the technique of Fresco and draftsmanship. Michelangelo spent only a year at the workshop the moved into the palace of Florentine ruler Lorenzo the Magnificent, of the powerful Medici family, to study classical sculpture in the Medici gardens. He studied under famous sculptor Bertoldo di Giovanni there and exposed himself to many of the great artists of past centuries, Giotto, Masaccio, Donatello, as well as the masterpiece antiquities of ancient Greece and Rome: works that were held in Medici's vast collection. He also met many living artists, philosophers, writers and thinkers of the day, including Poliziano, Marsilio Ficino and Pico della Mirandola. 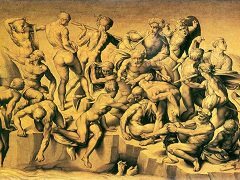 It was while he was with the Medicis that Michelangelo completed his first two commissions as a sculptor: marble reliefs, Madonna of the Stairs, and Battle of the Centaurs. Both amazingly sophisticated and complex works for a teenager. 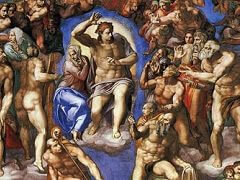 Michelangelo became, during this time, an expert in portraying the human form, drawing from life and studying anatomy. He also obtained special permission from the Catholic Church to study human corpses to learn anatomy, though exposure to corpses had worsened his health condition. After the death of Lorenzo de Medici, Michelangelo left the Court and, soon after, the arrival of Savonarola and the expulsion of the Medicis from Florence brought huge change for the young artist. After a short return to his father's house, Michelangelo left Florence during the political upheaval and, maintaining his links to his patrons, the Medicis, he followed them to Venice, then on to Bologna. In Bologna, Michelangelo continued his work as a sculptor. He carved three statues for the Shrine of St. Dominic, an angel with a candlestick, and saints, Petronius and Proculus. Continuing to be heavily influenced and inspired by classical antiquities, Michelangelo also became involved in a scheme to pass off one of his sculptures, a marble cupid, as an ancient work. Allegedly, he was told by Lorenzo di Pierfrancesco de Medici to make it look as though it had been dug up, so he could sell it in Rome. Cardinal Raffaele Riario, who bought the piece, discovered the deception, but was so impressed by the quality of the sculpture that he invited the artist to Rome. 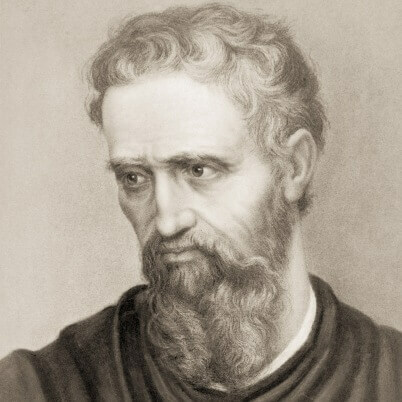 Michelangelo arrived in Rome in 1496 when he was 21 years old. 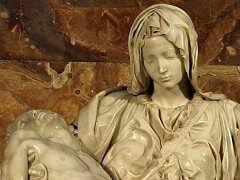 It was while in Rome, in his early twenties, that Michelangelo sculpted Pieta, now in St. Peters in the Vatican, in which the Virgin Mary weeps over the body of Jesus. Michelangelo went to the marble quarry and selected the marble for this exquisite piece himself. 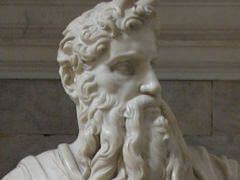 It was frequently said that Michelangelo could visualise the finished sculpture just be gazing at a block of stone. He was now a man at the height of his creative powers, and, in 1504, back in Florence, he completed his most famous sculpture, David. David, depicted at the moment he decides to battle Goliath, was a symbol of Florentine freedom. It is said to be a masterpiece of line and form. A committee, including Leonardo da Vinci and Sandro Botticelli, was created and decided on its placement, in front of the Palazzo Vecchio. Michelangelo accepted many commissions, sculptures and paintings during his time in Florence, many of which went unfinished when, in 1505, he was called back to Rome to work on a Tomb for Pope Julius II. It was planned to be finished within 5 years but he worked on it (with frequent interruptions) for over forty years, and it seems it was never finished to his satisfaction. Fortunately, Michelangelo also completed some of his best, and most well-known work, during this time, most notably the fresco on the ceiling of the Sistine Chapel, which took him four years to finish. This grand fresco contains over three hundred figures over five hundred square meters of ceiling. It took Michelangelo four years, lying on his back, to complete this masterful work, which stands even today as a testament to this one man's dedicated and accomplished artistry. The scenes depicted are from the Book of Genesis, the most famous of which is The Creation of Adam. The outstretched hands of God and Adam are an iconic image, perhaps the most widely known and imitated detail from any renaissance piece. Michelangelo, in this work, demonstrated his deep understanding of the human form, and how to depict it in a huge array of different poses. The complex, twisting figures and vibrant colors of this work, and the sculptures with their writhing forms, played a huge role in the birthing of an entire artistic movement. Mannerism, largely derived from the work of Michelangelo, is a deliberately stylized form of sophisticated art, in which the human body is idealized. It can be characterized by often complex, and sometimes witty, composition and unnatural use of vibrant colors. Without Michelangelo, the works of later Mannerist artists like, for example, Pontormo and Bronzino, would not exist. Raphael was also strongly influenced by Michelangelo, as were later ceiling painters in the Baroque period, and many others since. His influence on art over the past centuries cannot be estimated. He is rightly viewed as a genius, and as the archetypal Renaissance man. One of the leading lights of the Italian Renaissance, Michelangelo's talents were prodigious; not only was he a superb painter, he was also a magnificent draughtsman, sculptor, poet, and architect. His paintings and frescoes were largely taken from mythological and classical sources and were deployed for the main part in religious work. He managed to combine his high level of technical competence and his rich artistic imagination to produce the perfect HighRenaissance blend of aesthetic harmony and anatomical accuracy in his work. Just like William Shakespeare on literature, and Sigmund Freud on psychology, Michelangelo's impact on art is tremendous. 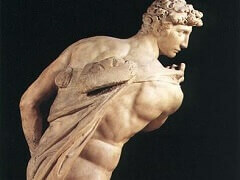 Michelangelo not only outshines all his predecessors; he remains the only great sculptor of the Renaissance at its best. What most Late Renaissance artists lacked was not talent but the ability to use their own eyes and share a vision with either their contemporaries or posterity. Michelangelo's extreme genius left little scope for works that escaped his influence, damning all his contemporaries to settle for aping him. Appreciation of Michelangelo's artistic mastery has endured for centuries, and his name has become synonymous with the best of the Renaissance Art.